The BRAKE is made from UV stabilized injection molded high end custom formulated fiber filled nylon. Engineered for strength and durability for years of trouble free use. From gheenos to flats boats, THE BRAKE is faster quieter and in most cases stronger than your traditional anchor. The complete system includes: The BRAKE, a 7' or 8' Stick It Anchor Pin with storage clips, the trolling speed anchor pin holder, a neoprene impact cushion, stainless steel hardware and instructions. For our customers who already own a 7 ft. or 8 ft. x 3/4" Stick It Anchor Pin, you can purchase the BRAKE separately which includes: the BRAKE, a trolling speed anchor pin holder, a neoprene impact cushion, stainless steel hardware and installation instructions. 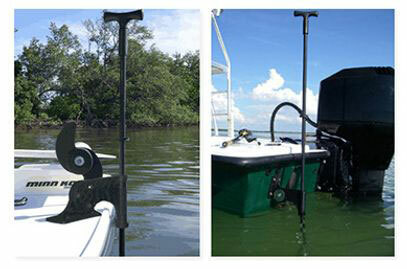 A universal mounting bracket that will mount to any transom angle or it can be mounted to any flat surface. Recommended for gheenoes and up to a 20' flats boat. THE BRAKE is faster, quieter and in most cases stronger than your traditional anchor. The complete system includes THE BRAKE, an 8 ft. anchor pin, the trolling speed anchor pin holder, 3/4" mounting clips, rough water safety straps to mount behind the mounting clips for extra security, a neoprene impact cushion and complete instructions.